SYDNEY-NEW PLYMOUTH The third Australia-New Zealand flight by the Fokker F.VIIb/3m, VH-USU "Southern Cross" piloted by Sir Charles Kingsford Smith with Captain P.G. Taylor (co-pilot and navigator), J.T. Pethybridge (engineer) and John Stannage (radio). S.E, Neilsen and J.T. Percival were again passengers. Of the Avro Ten, VH-UXX "Faith in Australia" piloted by Charles T.P. Ulm with G.U. Allan and R. Boulton. Arrangements had been made with the N.Z. Post Office to carry an official air mail on the flight with the issue of a special 7d Air stamp and the distribution of official souvenir covers. 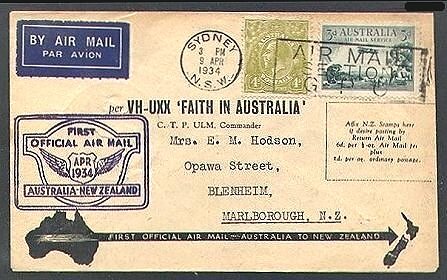 These covers had been ordered by Ulm from a Christchurch printer and the flown covers included envelopes from small trial printings, Also in the flown mail were 100 of the special Post Cards flown to N.Z. on 3 December making a total of 39,255 letters flown. A number of special 'relief' postmarks were in use at Auckland to cope with the quantity of mail received and a special circular cachet was also applied. Internal Flight: 1934, 24 Mar. Of VH-USU "Southern Cross" piloted by Sir Charles Kingsford Smith with Captain P.G. Taylor (co-pilot and navigator), LT. Pethybridge (engineer), John Stannage (radio) and J.T. Percival (passenger). 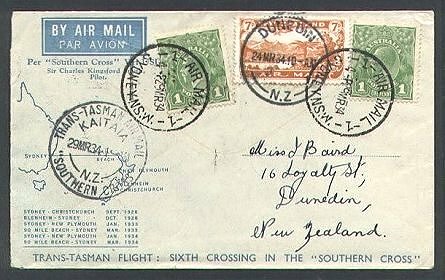 Special souvenir covers were distributed marking the 'Sixth Tasman Crossing' by Kingsford Smith and a special commemorative postmark was used. (Approximately 6 similar hand cancellers were in use). The Fokker took off from Ninety Mile Beach at 3.30am and landed at landed at Mascot after a flight of 13 hours 25 minutes. Internal Flight: 1934, 12 Apr. 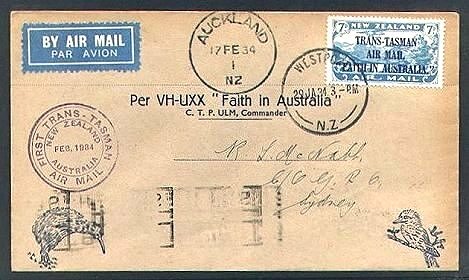 By VH-UXX "Faith in Australia" with Charles Ulm, G.U. Allan, and R. Boulton was an immediate turn round of the flight of 11-12 April. 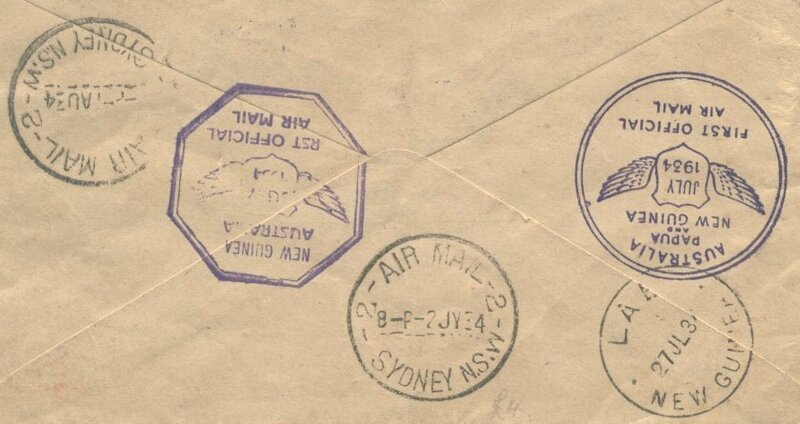 An official air mail was carried with souvenir covers again available and a distinctive circular flight cachet applied. At least 4 Kaitaia 'relief' postmarks together with a regular hand cancellation were in use. The air mail postage to Australia was again 7d 12,299 covers from the flight of 11-12 April were included in the return air mail. SYDNEY-NEW PLYMOUTH-WELLINGTON "FAITH IN AUSTRALIA"
"Goodwill Flight" by Charles T.P. Ulm with G.U. Allan (co-pilot) and R. Boulton (engineer). When Ulm was unable to conclude arrangements for a further official Australia-New Zealand Trans Tasman mail he made a "Goodwill Flight" which landed briefly at New Plymouth before continuing on to land at Rongotai Aerodrome in Wellington. Unofficial letters were carried to the Governor General, the Prime Minister and other dignitaries together with 250 special "Goodwill" covers, a few plain manila covers posted at Sydney before take off and at Wellington on arrival and a bundle of a "Special Edition" of the Sydney "Sun" newspaper. By the "Faith in Australia" finally began on 24 July with Charles Ulm, G.U. Allan, and R. Boulton flying Brisbane-Rockhampton-Townsville-Cairns-Port Moresby-Lae carrying the mail from New Zealand as well as that from Australian collectors. Special cachets were applied at Port Moresby and Lae and many of the covers were flown from these places to Sydney on the return flight. A variety of routings can be found but for this listing only the main New Zealand covers are considered. During the period up to the commencement of the flight, covers arrived at Sydney from N.Z. by ship for inclusion in the air mail. Kaitaia-Sydney-Brisbane-Rockhampton-Townsville-Cairns-Port Moresby-Sydney and sea to N.Z. Kaitaia-Sydney-Lae-Sydney and by sea to N.Z. Squadron Leader J.D. Hewett and Flying Officer C.E. Kay took part in the MacRobertson Centenary Air Race from London- Melbourne, in the D.H.89 Dragon Rapide, ZK-ACO "Tainui", coming in third in the Handicap Section. They decided to complete the journey home by flying the Tasman Sea. On 14 November, Hewett and Kay with F. Stewart (who had been a passenger on the flight from the U.K.) as radio operator, left Richmond Aerodrome, Sydney and landed with the aid of flares at Milson Aerodrome, Palmerston North. The "Tainui" ran through a perimeter fence at the end of the runway and sustained some minor damage. Printed souvenir covers which had been flown from Mildenhall to Melbourne were carried across the Tasman and postmarked PALMERSTON NORTH 15 NO 348-PM and another 12 covers were posted in Auckland -PAPAKURA 16 NO 34.6, These have handwritten inscriptions on plain covers. By R.G. Whitehead and E.R. Nicholl in the D.H.80A Puss Moth, VH-UON "Faith in New Zealand". In spite of the Australian Civil Aviation revoking their Airworthiness Certificate the plane took off from Gerringong Beach at 1.55am and had an uneventful flight across the Tasman until they reached the upper part of N.Z. and were unable to establish their location. A landing was made at East Beach, North Auckland, where they spent the night, flying on to land at Mangere, Auckland just before 7.00am on 23 November. An estimated 12 covers were flown and are postmarked ENMORE NSW 19N0 34 and have a typed inscription. For the inaugural flight on Brisbane-Singapore section of the Empire Route from Australia to England and connecting with the African service. Qantas had gained the contract and the official opening on 10 December, was made with the D.H.61, VH-UIC "Diana" commanded by Captain L Brain and the D.H.50J, VH-ULG "Hippomenes" flown by Captain R. Tapp (who was replaced at Roma by Captain G.U. Allan). The N.Z. acceptances closed in Auckland on the 30 November and the mail was sent on to Sydney by the SS "Monterey" and later to Brisbane. 3,754 items were received for the U.K. and 464 for other destinations. For the Empire route flight from London to Brisbane and from the connecting South African services. The service from Cape Town left on the 4 December and from London on the 8th with the Handley Page H.P.42W, G-AAXE "Hengist", The mail was transferred to the Qantas D.H.SOJ, ZK-ULG "Hippomenes" at Singapore on the 16th and arrived at Brisbane on the 21 December. Mails for N.Z were backstamped SYDNEY N.S.W. 10PM 21 DEC 1934. Internal Flights: 1934, 19 Dec. / 1934, 31 Dec. / 1935, 21-29 Jan. / 1935, 16 Apr. By the "Southern Cross". After the near disastrous interrupted flight by Sir Charles Kingsford Smith (see 15 May, 1935) the Post Office abandoned the idea of sending mail on a return flight and this was sent by ship to Sydney, where mail for forward addresses was placed on the regular services. Unfortunately some of these covers are still incorrectly advertised as flown Trans-Tasman. Internal Flight: 1935, 5 Aug.
Walter H. O'Hara flew his British Klemm BKI Eagle, VH-USP "Zealandia" from Gerringong Beach, Sydney to Mangere Aerodrome, Auckland in 12 hours 47 minutes and became the first New Zealander to complete the solo Trans Tasman flight. Earlier he had been refused a Certificate of Airworthiness to make the flight by the Australian Civil Aviation authorities. About 12 covers were carried on the flight and most if not all, are envelopes with the motif of the Air Mail Society of NS.W. and franked with a N.Z. stamp postmarked WARKWORTH 1 NO 35 12PM and signed by O'Hara. CRASH OF IMPERIAL AIRWAYS "SCIPIO"
Imperial Airways Short 5-17 Kent Class Flying Boat G-ABFA "Scipio" commanded by Captain A.S. Wilcockson crashed in bad weather while attempting to land off Mirabella, Crete. Two passengers were killed and the mail submerged but was later salvaged and dried out. A quantity of mail from New Zealand was on the flying boat. Four cachets were used on mail at the London G.P.O. Internal Flight: 1936, 7 Sept. CRASH OF IMPERIAL AIRWAYS "BOADICEA"
Imperial Airways Boulton & Paul 71A Mailplane, G-ACOX "Boadicea" commanded by Captain A.C. Thomas crashed in the English Channel while flying to Paris. The aircraft carried a full load of mail for Africa, India, Australia and a small quantity for New Zealand. No passengers were on board. One bag of mail was recovered near Calais in October, another off the coast of Kent in November but the third was not recovered until April 1938, off the Kent coast. Some of the salvaged letters including a few for New Zealand were forwarded to Sydney where a cachet was applied. CRASH OF IMPERIAL AIRWAYS "ATHENA"
Imperial Airways Armstrong Whitworth A.W.15 Atalanta, G-ABTK "Athena" Commanded by Captain V.C. Wilson was destroyed by fire after refuelling at Delhi. There was no loss of life and most of the mail was saved and sent on to Sydney and Auckland. At Sydney a two line cachet was made up from type from a rubber stamp set and at Auckland a small 2-line cachet was applied in red. Miss Jean Batten broke the England-Australia solo record when she reached Darwin in 5 days 21 hours in her Percival Gull Six. G-ADPR. On 16 October she took off from Richmond Aerodrome, Sydney and landed at Mangere Airport, Auckland, completing her London to Auckland solo flight in 11 days and 45 minutes. One cover is known to have been carried London-Sydney and at least 3 were flown to New Zealand. Internal Flights: 1936, 9 Oct. / 1936, 27 Oct.
After completing a solo flight from England to Australia in his Percival Gull Four, ZK-AES, L Ernle Clark took off from Richmond Aerodrome, Sydney and landed at Omaka Aerodrome, Blenheim on 15 November. After a brief stop he flew on to Wigram Aerodrome, Christchurch. 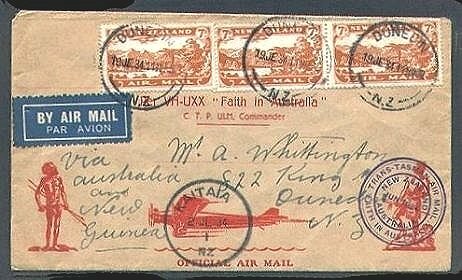 A small number of covers was flown from England to Australia and approximately 6 covers postmarked ENMORE NSW 14N0 36 were carried from Sydney to Christchurch. Internal Flights: 1936, 7 Dec. / 1936, 22 Dec. / 1936, 23 Dec. / 1936, 28 Dec. / 1937, 20 Feb. / 1937, 23-24 Feb. 1937, 2 Mar. First San Francisco-Hong Kong Trans Pacific service connecting with the Imperial Airways and Qantas mails flights to Australia (and by sea to N.Z.). Many covers have the PAA cachets but very few are backstamped in New Zealand. Internal Flights: 1937, 13 May / 1937, 13 May / 1937, 18 June / 1937, 27 June / 1937, 27 June / 1937, 27 June / 1937, 27-29 June / 1937, 27 June-4-5 July / 1937, 4 Aug. / 1937, 2 Sept. / 1937, 30 Oct. / 1937, 30 Oct. / 1937, 30 Oct. / 1937 31 Oct. / 1937, 19 Nov. / 1937, 20 Nov. CRASH OF IMPERIAL AIRWAYS "CYGNUS"
Of Short S23 flying boat G-ADUZ "Cygnus" when taking off from Brindisi on 5 December. Two passengers were drowned and seven injured. Mails for the U.K. from New Zealand, Australia and Malaya, salvaged from the sea had cachets applied in London or Paris and were forwarded to addressees where possible. Imperial Airways survey flight by Empire flying boat G-ADUT "Centaurus" commanded by Captain J.W. Burgess. The "Centaurus" left England on 3 December, arriving at Darwin on the 14th and Sydney on the 24th. On 27 December the flying boat left Rose Bay, Sydney and alighted on the Waitemata Harbour after a flight of 9 hours 15 minutes. After visits to a number of N.Z. cities, the "Centaurus" left Auckland on the morning of 10 January alighting at Rose Bay, Sydney after a flight lasting 10 hours. Following publicity flights in Australia the flying boat arrived back in Southampton on 23 February. A special cover was prepared for the flight but does not appear to have been used on some stages. Note: Figures of flown covers below are based on known items but it is thought that more may exist including the special Imperial Airways covers. One shilling and sixpence to American Samoa, Three shillings to Hawaii and Four shillings and sixpence to USA Post cards were accepted at half listed rates. Although the N.Z. Government had granted FAA air rights for the service up to 31 December 1937 an extension was granted allowing the flight to proceed. On 3 January at Honolulu the mail was transferred from the "Samoan Clipper" to the Martin 130 flying boat NC-14715 "Philippine Clipper" and flown on F.A.M. Route 14 to the USA The "Samoan Clipper" departed from Honolulu on 9 January on the return flight to New Zealand but shortly after leaving Pago Pago on the 11th the flying boat was lost with all on board. Internal Flights: 1938, 10 Jan. / 1938, 17 Jan. / 1938, 24 Jan. / 1938, 4 Feb. / 1938, 5 Feb. / 1938, 4 Mar. Flight by D.H.88 Comet G-ACSS "Australian Anniversary" flown by Flying Officer A.E. Clouston and Victor Ricketts "Cygnus" which left Gravesend airfield near London on 15 March and 80 hours and 55 minutes later landed at Sydney. Next morning they took off from Mascot Aerodrome and landed at Omaka Airfield, Blenheim, breaking the England-New Zealand flight time record. The following day the Comet flew back to Sydney and then to London in a total flying time of 110 hours and 27 minutes for the round trip. N.Z. CONNECTIONS WITH THE SYDNEY-PORT MORESBY-SALAMAUA-RABAUL W.R CARPENTER & CO LTD SERVICES. This mail was flown in the D.H.86B VH-UYU "Carmania" flown by Captain R.O. Mant. The return service began on 3 June with mail for N.Z. accepted but no quantities are recorded. It is believed that N.Z. covers were flown in small numbers on all sections. Inaugurated the England-Australia flying boat service with the Short S.23 Empire flying boat G-AEUB "Camilla" (Captain E.S. Alcock). At Singapore the mail was transferred to the Short S.23 G-ADVD "Challenger" (Captain G.U. Allan), leaving there on 2 July and arriving at Darwin the next day. Mails were flown from Darwin to Sydney by MacRobertson Miller Airlines and mail for N.Z. was sent on by sea. By KLM Royal Dutch Airlines and KNILM Royal Netherlands Indies Airlines on the inauguration of the Amsterdam-Batavia-Denpasar-Sydney service. Mail was accepted from Great Britain for Australia and New Zealand with special cachets applied at Amsterdam and Batavia Post Offices. Some covers from the U.K. were in bags which did not receive the cachet at Amsterdam, The flight from Amsterdam to Batavia was made by KLM Douglas D.C.3 PH-ARE "Emoe" and from Batavia to Sydney by the KNILM Lockheed 14 Super Electra PK-AFM (Captain van Messel), N.Z. Mail was sent on to Auckland by sea. Imperial Airways and Qantas Empire Airways inaugurated the final stage of the 'All Up' air mail service to British Empire countries served by the England-Australia route. 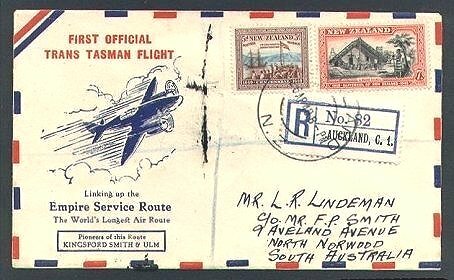 Mail from New Zealand had a postage rate of one and a half pence for a standard half ounce letter and it was forwarded to Sydney by sea to connect with the air service. The King George VI One and a half penny stamp was issued on 26 July and many covers were posted on that day. As the 'All Up' rate enabled letters to be sent world wide, a large range of connections was flown. Internal Flights: 1938, 14 Sept. / 1938, 27 Oct. / 1938, 22 Oct. / 1938, 20 Oct. / 1938, 7-8-9 Nov. / 1938, 7 Nov. / 1938, 9 Nov. While attempting to alight on Lake Habbaniyah at night in a sand storm, "Calpurnia" crashed and was destroyed. The pilot and First Officer Spottiswood and two passengers were killed. The Christmas mail for Australia and New Zealand was salvaged from the water and, after being dried out, was sent on. At the Wellington GPO cachets were applied and identifiable items sent to addresses. At least one cachet was used at Auckland, three at Wellington, and at Dunedin the few items without cachets had a typed explanatory note attached. WRECK OF QANTAS EMPIRE CLASS FLYING BOAT, VH-ABF "COORONG"
(Captain Lester Brain) had flown from Koepang to Darwin with the mail from the U.K. for Australia and New Zealand but was driven ashore in a gale on 12 December and badly damaged, The mail was salvaged and N.Z. bags sent to Auckland where items were delivered with a letter of explanation. Internal Flights: 1939, 15 Mar. / 1939, 15 Mar. / 1939, 20-21 Mar. CRASH OF IMPERIAL AIRWAYS "CHALLENGER"
Short S.23 Empire flying boat G-ADVD "Challenger" carrying mails for South Africa, in Mozambique harbour on i May 1939. N.Z. mail forwarded to Sydney about 3 April was included in the bags salvaged and forwarded to Durban on G-ADHL "Canopus". Some letters were delivered without markings while others, which had been dried, received a bilingual cachet in English and Afrikaans. Inaugurated the Trans Atlantic service from New York-Horta-Lisbon-Marseilles with the Boeing 314 flying boat NC-18603 "Yankee Clipper" commanded by Captain Arthur E. LaForte. The U.S. 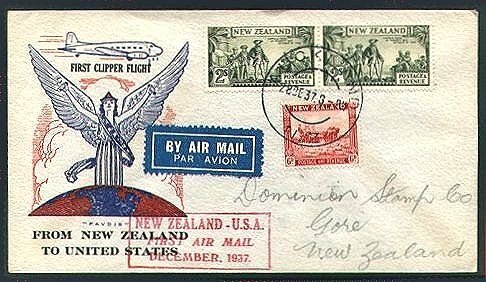 Postal Department accepted mails for New Zealand and other 'Empire Route' countries which was sent on from Marseilles to London and then flown by Imperial Airways to Australia. 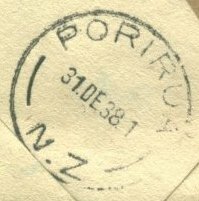 Special cachets were applied to mail posted at New York, Horta and Lisbon but only a few letters were addressed to N.Z. CRASH OF IMPERIAL AIRWAYS "CENTURION"
Short S.23 Empire flying boat G-ADVE "Centurion" en route Sydney to London. G-ADVE was capsized by a gust of wind while alighting on the Hooghly River at Calcutta on 12 June 1939. Mail including letters posted up to 2 June in Auckland was immersed in sea water although the crew and passengers were saved. Five similar 2-line cachets made up from rubber type were used as well as framed cachets. With the deteriorating situation in Europe it was considered that many commercial airfields in the U.K. could be at risk, as were some sections of the route and the service was suspended. Delivery flight of their first Short S.30 Empire Class flying boat ZK-AMA "Aotearoa" commanded by Captain J.W. Burgess. The "Aotearoa" left Southampton on 10 August landing at Rose Bay, Sydney on the 26th and leaving for New Zealand on the 28th where it landed at Mechanics Bay, Auckland on the same day. No official mail was carried but a very small number of covers was flown "by courtesy". RESUMPTION OF AMENDED "EMPIRE AIR ROUTE"
By Imperial Airways on a reduced schedule with postage rate increased to one shilling and sixpence for a standard half ounce letter. By the Short S.30 flying boat ZK-AMA "Aotearoa" under the command of Captain J.W. Burgess was made shortly after its arrival in Auckland. 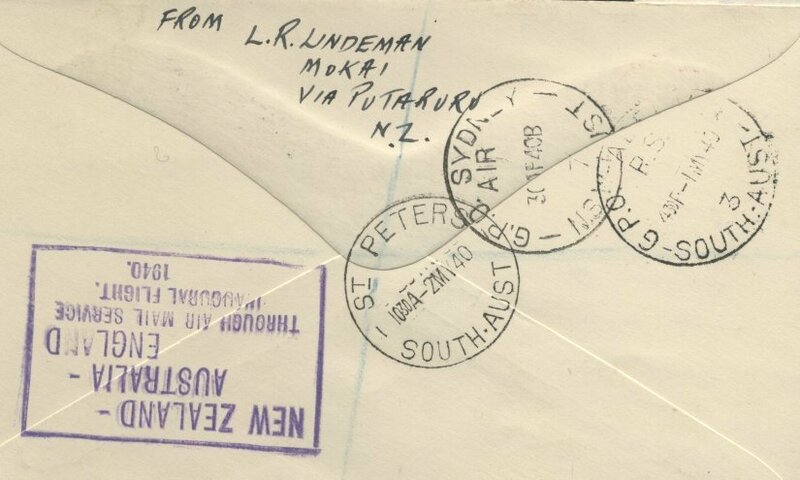 No official mail was flown from Auckland, although a few covers were carried unofficially, but one bag of approximately 500 for Auckland letters was received from the Suva Post Office and another of 500 letters for Australia. A small number of covers carried from Southampton was also flown. Tasman Empire Airways survey flight by ZK-AMA "Aotearoa" commanded by Captain J.W. Burgess. The flying boat flew from Mechanics Bay, Auckland to Rose Bay, Sydney on 24 September and after "showing the flag" at functions, the return flight was made on the 30th. No official mail was flown but some unofficial covers were carried. Second South Pacific survey flight by Tasman Empire Airways Ltd ZK-AMA "Aotearoa" commanded by Captain J.W. Burgess. No official mails were flown from Auckland. Approximately 2,000 items were flown from Suva to Auckland and about 250 from Nukualofa to Auckland. Internal Flights: 1939, 9 Nov. / 1939, 10 Nov. / 1940, 16 Mar. Tasman Empire Airways Ltd delivery flight of their second Short S.30 Empire flying boat ZK-AMC "Awarua" under the command of Captain Oscar Garden. The "Awarua" left Hythe, Southampton on 15 March and reached Sydney on the 28th, continuing to Auckland on 3 April. A small unofficial mail was carried. Tasman Empire Airways inaugural flight on the trans Tasman service by the Short S.30 Empire flying boat ZK-AMA "Aotearoa" commanded by Captain J.W. Burgess. 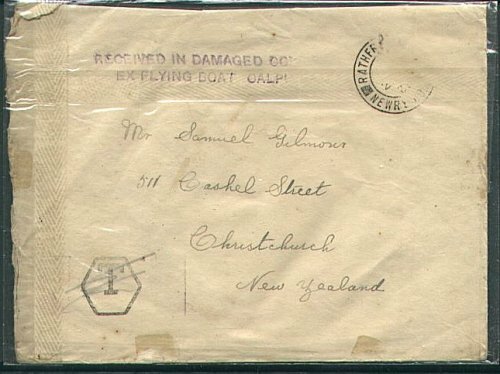 Several different covers were available and a large rectangular framed cachet was applied to mail at Auckland. Postage NZ -Australia was fivepence. At Sydney covers were backstamped SYDNEY 1PM 30 APR 1940. Covers to connect with U.K. and countries on Australia to England route. The return flight from Rose Bay, Sydney was made on 2 May but no official cachets were applied to mail at Sydney. Via Durban, Cairo and Sydney and vice-versa, connecting with the service from Britain-France- West Africa. First connecting flight from Sydney to Auckland was flown by Tasman Empire Airways Short S.30 Empire flying boat ZK-AMC "Awarua". Very few covers have been identified. With the Boeing 314 flying boat NC18606 "American Clipper" commanded by Captain John H. Tilton. Special cachets were supplied by the US. Postal Department for the first four points on the outward flight and Canton Island on the return trip. PAA supplied the other cachets except for the one used at Auckland, which was made by the N.Z. Post Office. Mail not flown San Francisco-Honolulu. By the Boeing 314 flying boat NC-18606 "American Clipper" commanded by Captain John H. Tilton. 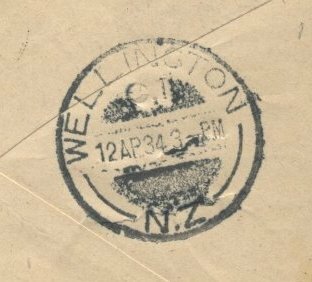 Mail from various Post Offices was accumulated at the Auckland, Wellington, Christchurch and Dunedin Chief Post Offices where the special cachet was applied. At Christchurch the cachet was struck in green, and in purple at the other three offices. The southbound and northbound flights both crossed the International Date Line.